Jenay is a lover of Tahoe Adventures. She lives her life guided by the practices of Yoga. Every run, bike ride and ski turn she makes includes physical awareness, mindfulness and consciousness of her impact upon her surroundings. This morning I packed my avalanche backpack. I made sure my beacon was working, had plenty of water, puffy coat in back pocket, and some tasty snacks to stash in my hip pockets. Then, I got cozy in my insulated gear and headed to the mountain. Our plan was to use the lift service at the resort and exit a side country gate to access some sweet stashes of untouched powder just beyond the groomed slopes. I love the backcountry. It’s far from the hustle of the resorts and offers peace, quiet and time to hear your thoughts. Unfortunately, getting out into the distant woods isn’t always practical. 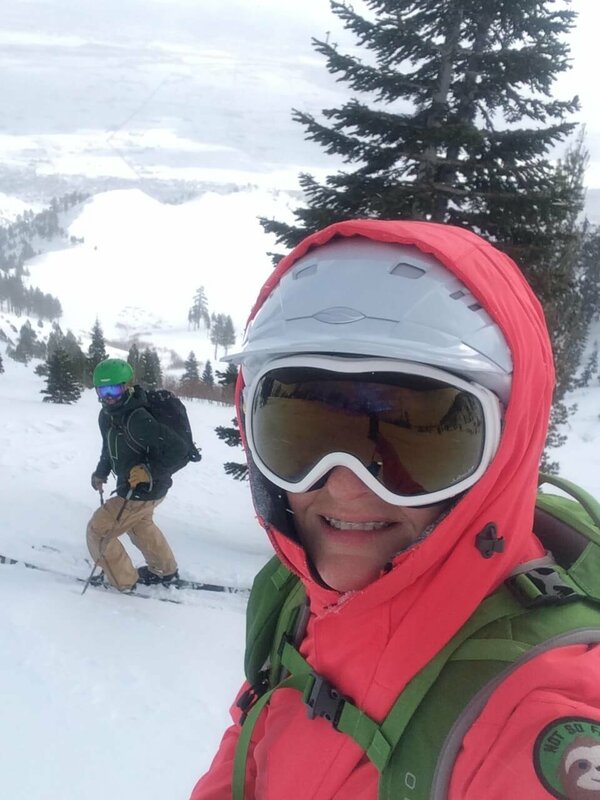 On a storm day when the lifts are slow due to wind and the avalanche danger is increasing by the hour, it doesn’t make sense to head out into potentially dangerous conditions. This is when the side country can hold the most potential. There is something reassuring about knowing, for at least the start of your run, you can still head back to the safety of the resort if needed. It’s like you get to taste the flavor before diving into the entire dish. 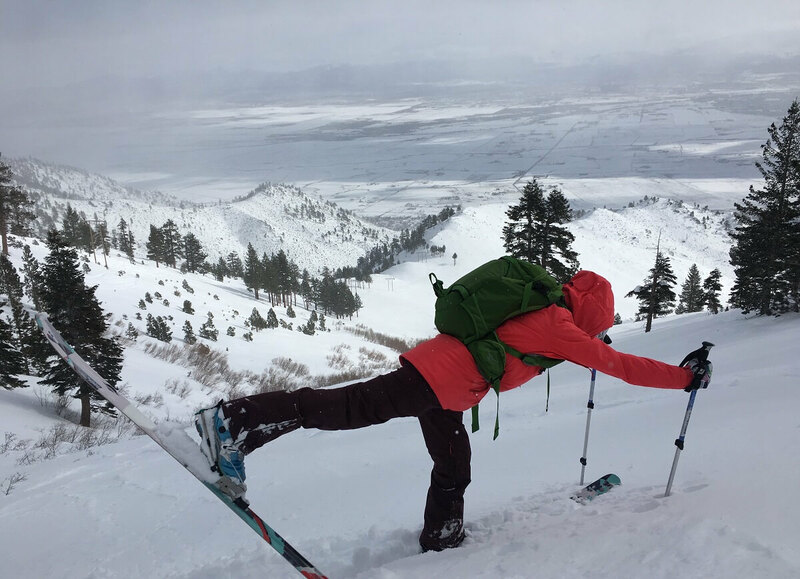 But if the conditions are good and snow stability right, you stick with your line and enjoy the ride. When it snows in Tahoe, I imagine that the lake has become the ocean. From my stomping grounds on the Nevada side, I can no longer see the mountains of California. The lake rises in white caps and the clouds move along the shoreline. This was not the view today though. Instead, our view was of the Carson Range, sun brightened and beautiful. As we skied through the untouched fluff that had fallen through the night and early morning, we could see the snow covered patchwork of the valley below. We had chosen the right day, time and location. There was no one around. We each chose our lines, which sometimes crisscrossed, leaving messages in the snow that we had been there before. There wasn’t a car, plane, or human voice to be heard. It was wonderful. After every few turns, we took a moment to look up to where we had begun and then down to where we were headed. We paused to discuss the conditions and our plan for the next few turns. We did not have to worry about who was ahead or following. The mountain was ours. All ours.